In a low expected return environment, investors look towards the high potential return premia associated with private investment programs to help meet their objectives. 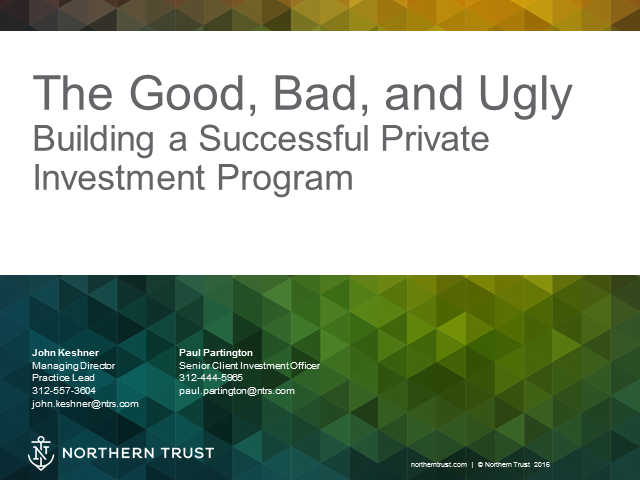 But in order to build a successful private investment program, investors need to not only focus on the “good” long-term expected return of these investments, but also prepare for the potentially “bad” initial drag on results and the corresponding “ugly” line items that may occur early in the process. Please join us for an in-depth view on the full-breadth of items that needs to be considered when planning a successful private investment program.